Afraid you can’t pick out the address amongst its neighbors in residential 16eme? No worries. The red and white flag at the gate should be a good indication that you’ve arrived at the right place. What place? L’Ambassade d’Indonesie, or the Indonesian Embassy. Do not be alarmed by the guard post. Sure, you may bring along photo identification to secure your entry, but the few times I’ve visited, we were waved through with an incantation of the magic words “saya mau makan”, meaning “I want to eat” in Bahasa Melayu. One steps into a courtyard upon gaining entry into the embassy, a neat little space where one can seat amidst greenery and Javanese stone sculptures. 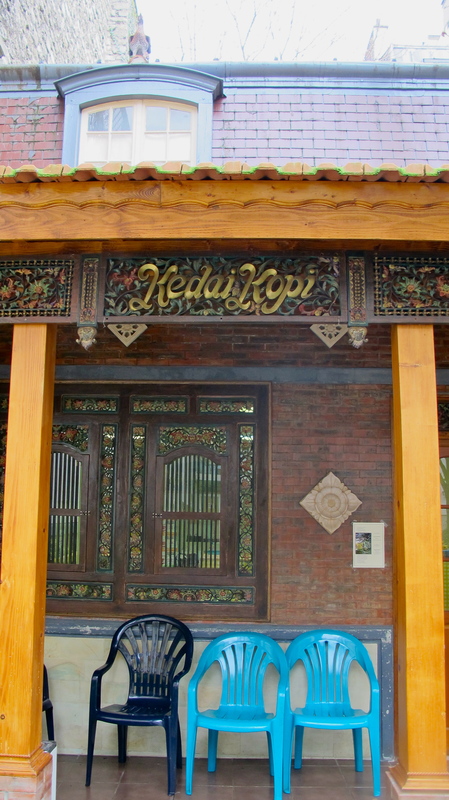 At the end of the courtyard is the “Kedai Kopi” or coffee-shop, where one will find within its threadbare, slightly rundown interior, walls of Indonesian food supplies (keropok crackers, spicy sambal, Indomie etc) as well as stacks of boxed meals at lunchtime. The establishment is run by an Indonesian Ibu with impeccable hair, she who presides over all the comings and goings in her grocery store-canteen seated behind the counter, rarely leaving her seat. 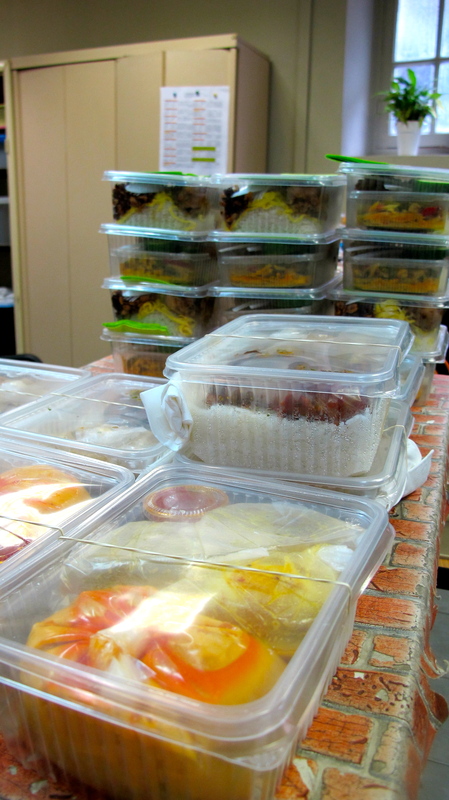 These boxed lunches are prepared by Indonesian ladies who live in the city, and the roster changes on a regular basis so that their most faithful clients – the employees of the embassy – get an authentic taste of the archipelago. Extra packs are made for those in the know: homesick Indonesians, other South-east Asians hunting for spicy food in Paris, local French fortunate enough to chance upon this find. The plastic lunch boxes look flimsy and the contents are simple, but at 6e a pop, they pack a wallop of spice and variety. 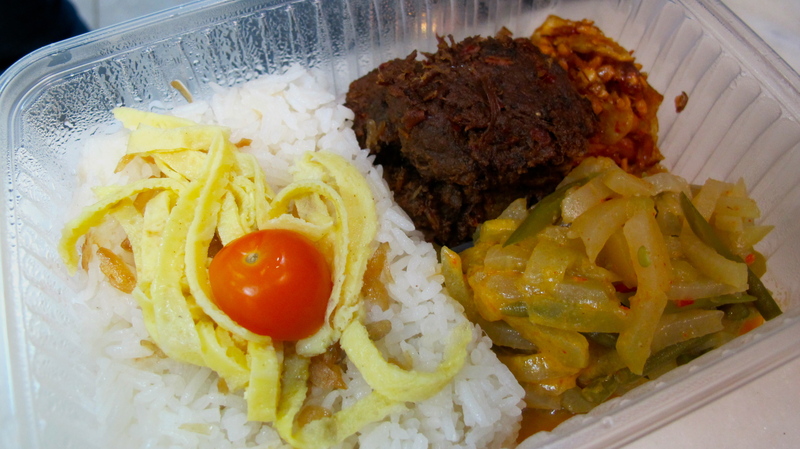 On any given day, there may be Indonesian staples such as mie bakso, nasi goreng, spicy deep fried chicken. Once in a while, the boxes contain fat pockets of fried tofu stuffed with vegetables and drenched in a sweet, sour sauce, or the flavorful beef rendang, its aromatic chili and coconut sauce sauce so well absorbed into the meat the stew is almost dry at the end of the cooking process. Even for those well-versed in South-east Asian cuisine, the Pempek Palembang might come as a surprise, a deep fried fish quenelle stuffed with an entire hard-boiled egg hard-boiled egg eaten with a rich vinegar sauce. An Indonesian friend was so happy to find Pempek in Paris that she promptly took 3 boxes home while getting the contact number of the coordinator so she could pre-order the food the next time she visited. The embassy’s courtyard is the other reason to visit, especially on warm, sunny days when one can finally move out of the depressing looking canteen and dine al fresco. If you are planning to visit Indonesia, this place will provide a primer on traditional local cuisine, serving better food than at the handful of Indonesian restaurants in the city. But even if a vacation is not in the cards, this is still one way to experience a little of what Indonesia has to offer. If there’s one thing my stint as a non-income producing housewife/student in Paris has taught me, it is how to stretch a penny while still enjoying the finer things in life. That was a timely skill to learn, since I was not content to waste my limited hours in Paris shuttling between home, school and Franprix, but at the same time did not wish to bankrupt the husband who was busy toiling away in school. For our visitors, Paris is associated with high hotel rates, costly museum visits, hefty restaurant bills and dreaded credit card charges that accompany coveted bags. While they (and we) are not bargain bin hunters and love a taste of la belle vie, some cost-cutting measures are always welcome. Chief of all concerns for short-stay tourists is lodging. When you only have 3-4 days (the average length of stay clocked by our visitors) in the city, you’d naturally want to be close to major monuments and shopping sites. With museums, department stores and 2 hour lunches on your schedule, there is no time to waste. Most tourists we know tended to locate themselves in the 7th and 8th arrondissements, their respective cultural markers being the Eiffel Tower and Avenue Champs Elysées. Sure, these areas are safe and convenient, but as all students of economics know, robust demand and limited supply lead to higher prices. Also, these areas are typically very touristy, lacking in cultural and local flavor, not too mention great food. For better hotel values, we suggest the arrondissements adjacent to the 7th and 8th, namely the 1st, 2nd and certain parts of the 15th. We lived in the 15eme and had lovingly christened it the “Toa Payoh” of Paris, both for its proximity to the centre of town and also the laidback residential feel. The area surrounding metro stations Cambronne, La Motte-Piquet, Dupleix and Bir-Hakeim are particularly convenient for visitors. For those looking to be literally in the centre of Paris, i.e. 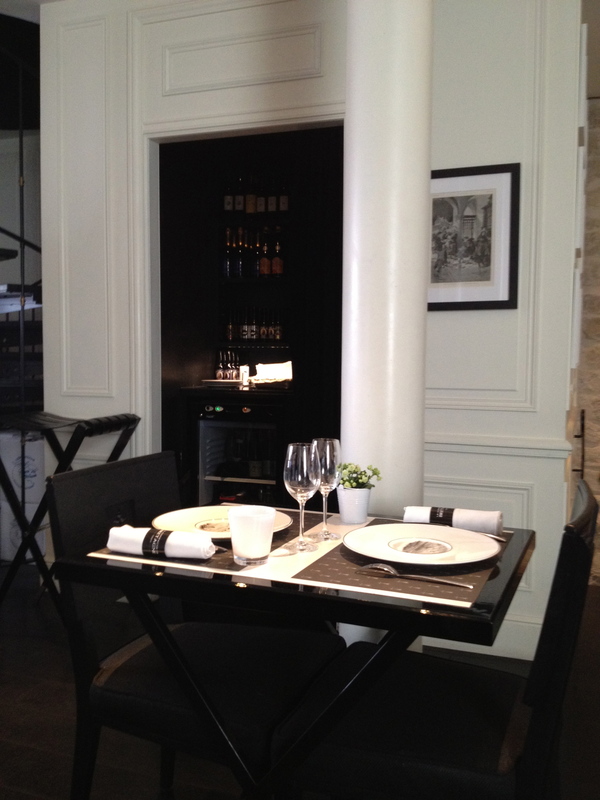 on L’ile de la Cité, a friend tipped us to this unconventional hotel: L’Hotel Hospitel Paris. You cannot get closer to the Cathedral Notre Dame and based on tripadvisor reviews, it is low-frills but cozy and cheap. The quirk? The 14 room hotel is located inside the hospital Hotel-Dieu, the oldest city hospital in Paris. Some people are wedded to the convenience the full-service hotels provide. For those more amenable to alternative lodging arrangements, apartments may be the answer. While not necessarily cheaper, apartments are great for larger parties, especially those with older or younger folks who appreciate the flexibility to stay in for dinner once in a while. 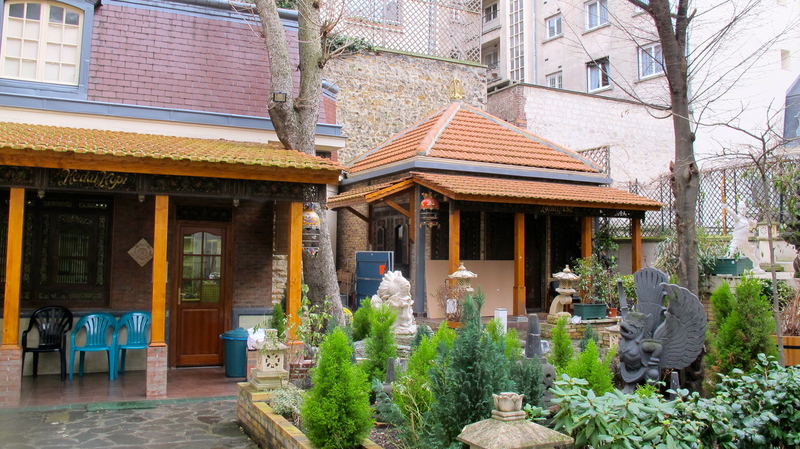 My parents still rave about the cute Marais studio where they stayed in 2008, complete with a little courtyard where my dad could practice his Tai Chi in the mornings. Typically, apartment rentals are reserved for those staying a week or longer, but sites like airbnb cater to short-stay visitors. A friend of ours booked a 2 bedroom apartment in Montmartre charmingly decorated by the photographer owner for her family through the website, paying no more than what she might have needed to fork up for 1 room in a 3 star hotel. 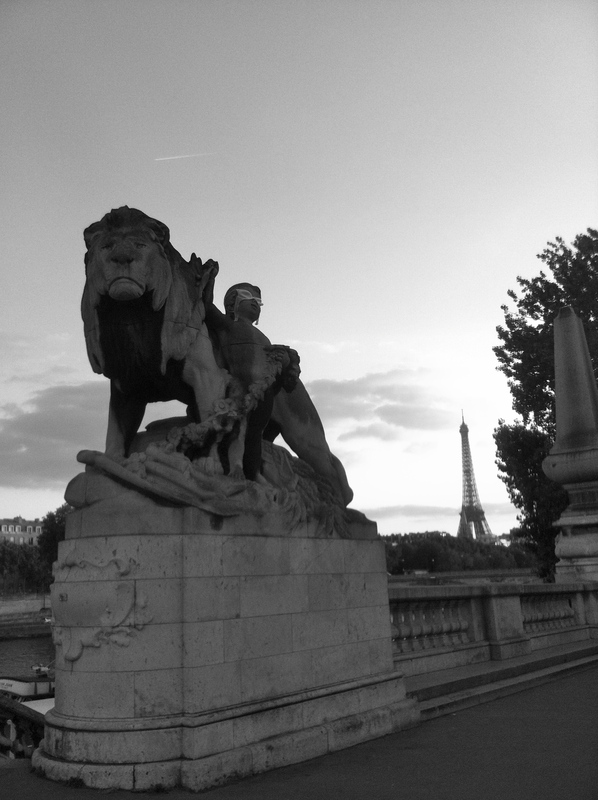 To me, walking is the best way to get to know Paris. With so many shops and cafes lining Parisian boulevards, walking is not a dull exercise merely to get from point A to B, and the cool dry weather makes promenading an enjoyable task. And since it’s also free, according to the law of compensatory expenses, you can then funnel the transportation savings into a cup of coffee, an eclair, or, if you’ve really walked a ton, a gorgeous scarf Parisians will approve. Biking is an option in Paris thanks to the Velib system. 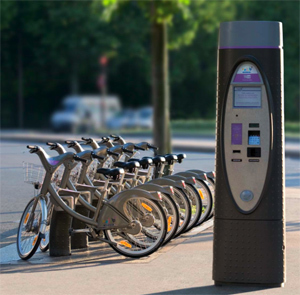 With 20,000 bikes parked in hundreds of stations dotting the city, the gungho and road confident can traverse Paris for as low as 1.70e a day. Journeys under 30 minutes are free of charge, so the key to minimizing cost is to switch bikes when you approach the 30 minute mark. Last but not least, the public transport system within metropolitan Paris is convenient and cost-efficient. With 16 lines criss-crossing the city, a metro station is always within walking distance, and some of them ain’t too bad looking too. But I prefer taking the more civilizing ride on a bus or tram particularly when it gets infernally stuffy in the non air-conditioned metro cars. Certain bus routes are especially scenic, such as #80 (Eiffel Tower, Ecole Militaire, Seine river, Avenue Montaigne, Champs Elysées, Montmartre) and #72 (along the Seine’s right bank, from Hotel de Ville to Trocadero). 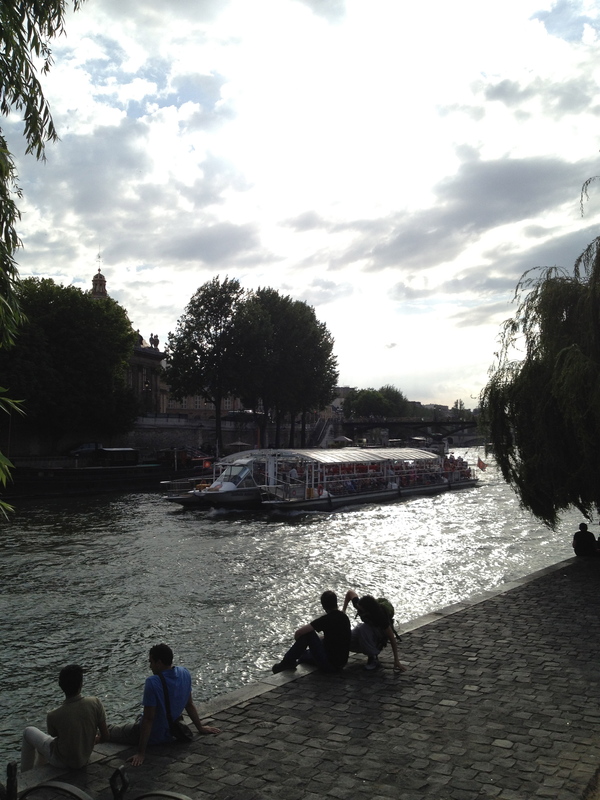 Avoid peak hour bus travel because Parisian traffic can be rather terrible then. The same type of ticket can be used on metro, buses, trams and RER trains within metropolitan Paris. The Paris Visite (9.75e) and Mobilis (6.40e) day passes are good options for those who’d like to minimize walking. Both types of tickets offer the same range of mobility, though the Paris Visite ticket includes certain discounts. If not, a carnet of normal tickets (12.70e for 10 tickets) is a better deal compared to purchasing single tickets (1.70e). Tip: Ask for a correspondence ticket when you board a bus or tram to get a free bus/tram transfer within 1.5hr of your initial ride. 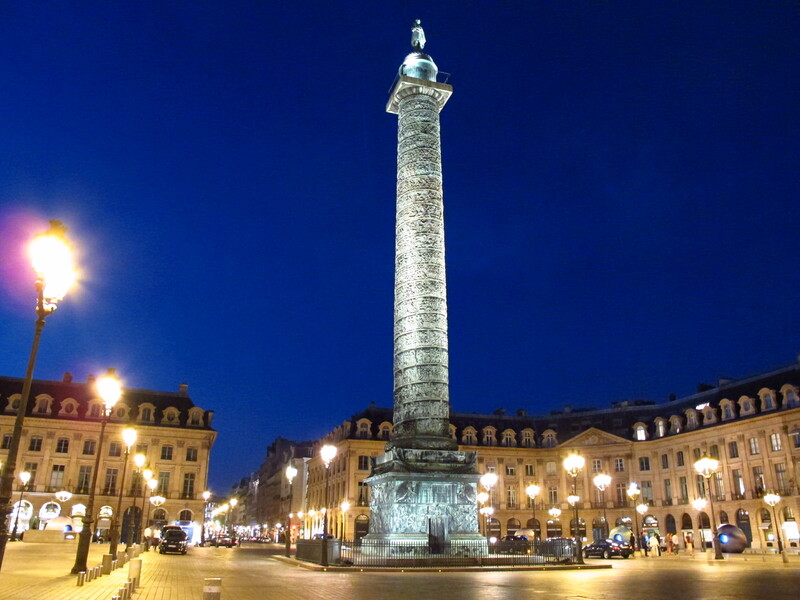 In Paris, the most famous monuments are but of course ticketed, so there really isn’t any way of getting out of the entrance fee to see Mona Lisa at the Louvre or walk through the gardens of Chateau Versailles. Except if you are visiting on the first Sunday of the month, when a large number of museums in the city and within Ile de France are open to public, FOC. The lines can be very daunting at the Louvre and perhaps Musée D’Orsay, but it was a breeze entering all the other museums we’ve visited on those Sundays. All the Musées de la Ville de Paris also have permanent collections freely open to public all year round, my favorites being Musée Carnavalet, the Paris history museum, as well as Maison Victor Hugo, the author’s former residence preserved in 19th century bourgeois decor. Most first-time visitors aim to scale the Eiffel Tower for a panoramic view of the city. Me? I’m happier eschewing the monstrous lines, and prefer checking out the art-deco detail from the base, or watching the tower blink on the hour from afar. But if I had to choose my favorite free spots with great views, I’d go for the phenomenal panorama (free and without crowds!) at Parc de Belleville, as well as the intimate perspective of the right bank from the rooftop terrace of Galleries Lafayette department store. 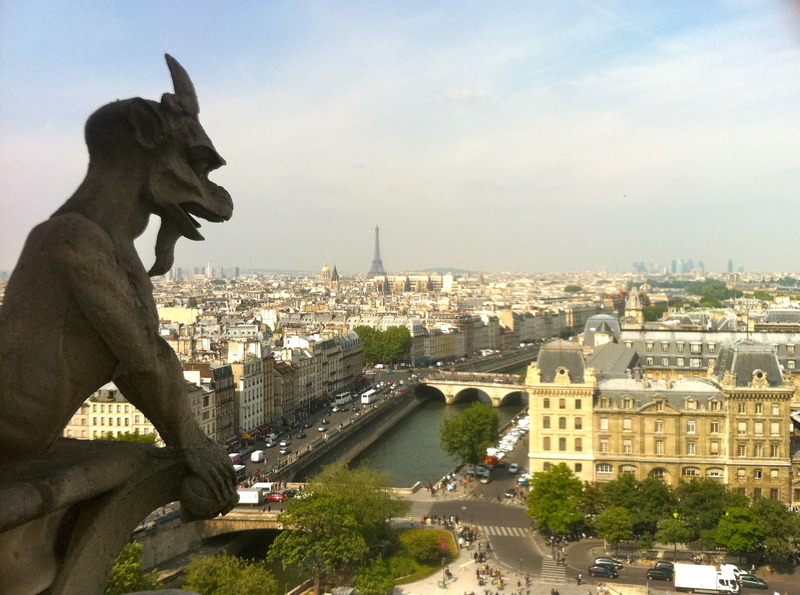 But lest one writes me off as a cheapo, I’d gladly pay to be at eye level with Notre Dame’s gargoyles. 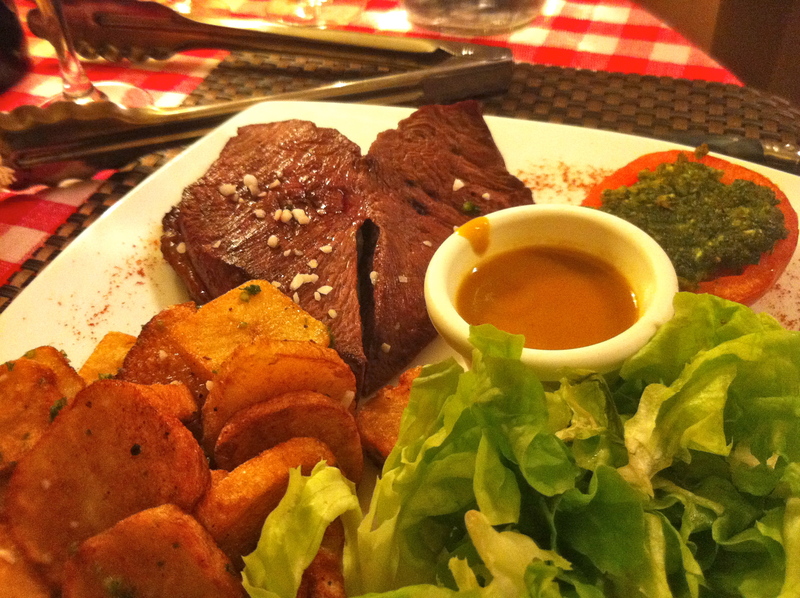 Loving food, the total restaurant bill for our time in Paris were only second to rent when it came to household expenses. And no we did not dine like kings every single day. In fact, we cooked most days and the husband’s de facto lunch at the canteen was a 1.67e plate of steak haché (aka burger patty) and boiled vegetables. When we did eat out, we looked for restaurants that promised high price-quality ratios, or offered attractive menus (les formules in French). 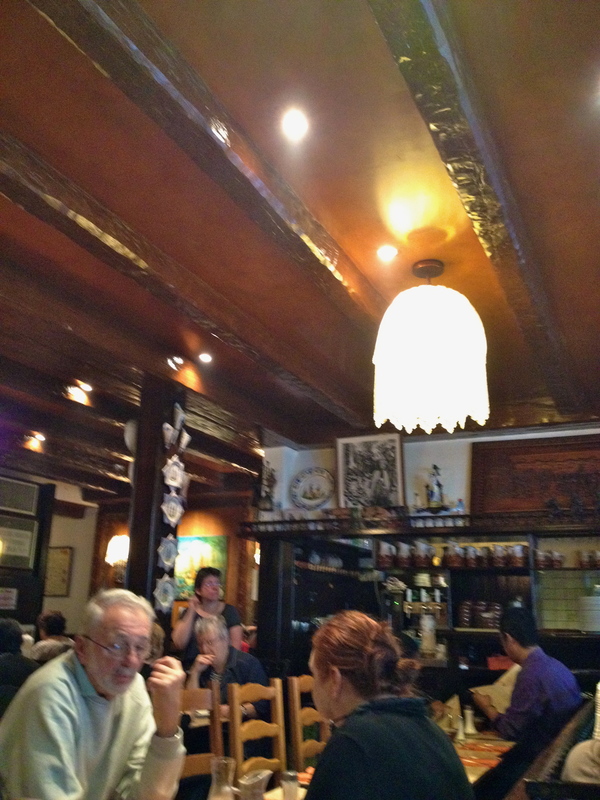 While most were rustic looking bistros situated far outside of the high-rent areas, some even delivered the “chic”. The best deals are found during lunchtime. 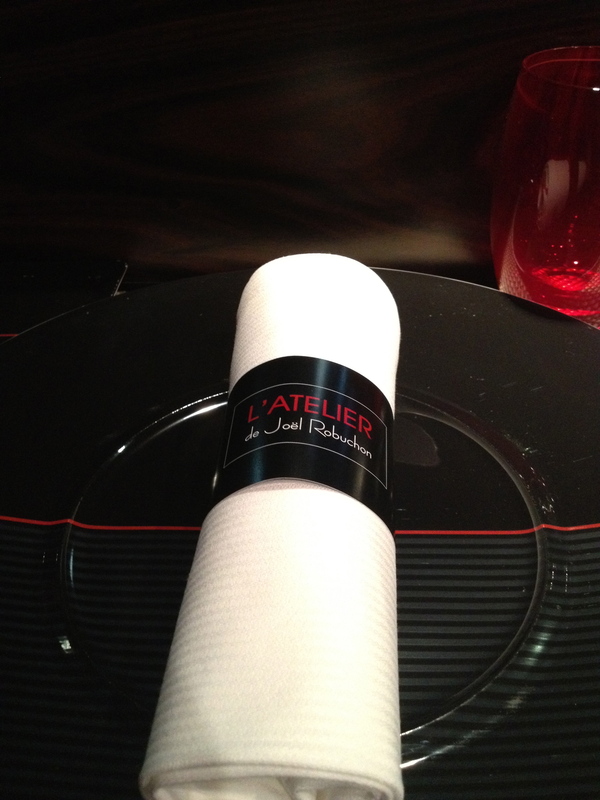 Starting at 37e, the pre-fixe lunch formule at L’Atelier de Joel Robuchon Etoile is hands-down the most economical Michelin starred lunch in Paris. Twice we’ve eaten there and twice we were treated to creative and delicious modern French cooking realized by Robuchon’s acolytes. 35e seems to be the minimum needed to have dinner at a decent restaurant in Paris, so says the Michelin guide, which designates a Bib Gourmand status to excellent restaurants serving under 35e 3 course meals. Out of 76 restaurants in the class of 2012, we’ve been to around 15, of which L’Affriole stood out for it’s excellent service, top notch cooking and an modern, elegant setting whereby one is not bumping elbows with the folks at the next table. 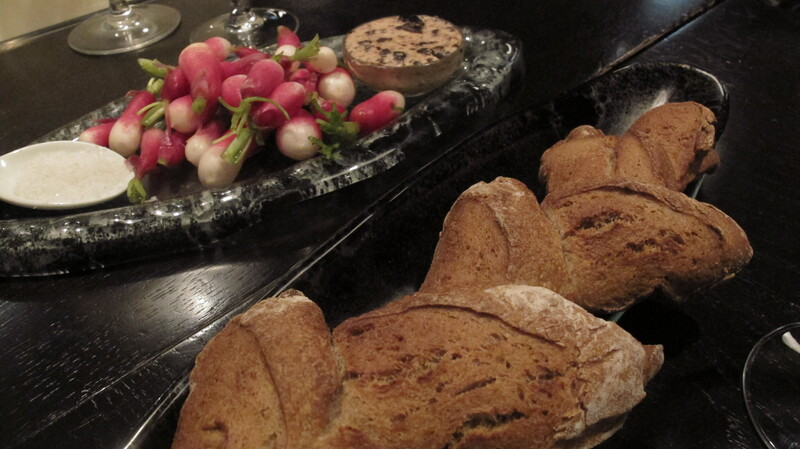 Loved, loved, loved the radish mise-en-bouche, a simple yet vibrant touch both to the decor and to the palate. Picnicking was one of our favorite ways to spend warm, sunny afternoons with friends or just as couple, and we highly recommend it to visitors to engage in this veritable Parisian pastime. A gourmet spread is easily assembled simply by visiting either 1) an outdoor food market (where the scent of roasted chickens prompts immediate distress signals to one’s stomach), 2) a chi-chi food hall, the likes of Le Bon Marché’s Grand Epicerie or Lenotre, or 3) even a supermarket (I am partial to Monoprix, whose gourmet house-brand products, like their cheeses and charcuteries are very very decent). There’s virtually hundreds of suitable locations to faire le pique nique, be it Marie Antoinette style on the Grand Lawn of Chateau Versailles or a romantic soirée on the kitschiest icon of unbreakable love, the lock-festooned Pont des Arts. As for me, I would spend my next Parisian picnic at dusk on the tip of Ile de la Cité in Square du Vert-Galant, with some sausages and champagne, the Seine and P for company. Finally, we have to credit the restaurant reservations website La Fourchette (aka The Fork) for helping us save some while still eating out. Many restaurants on the website seek to drum up business by offering discounts and special-priced menus on the website. While the bulk of these restaurants are not of the critically acclaimed and heavily publicized genre, and some may indeed by lemons (we’ve once gone to a Moroccan restaurant, to find out the kitchen stove was out of order and the only things we could order were microwaved couscous. We walked out immediately. 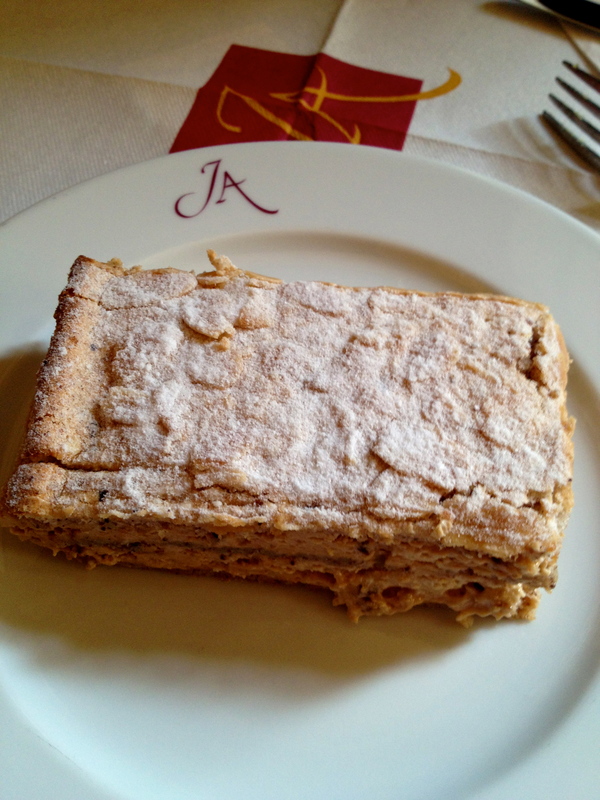 ), there are gems among the chaff, such as 50% off the ala carte menu at Michelin starred L’Ambassadeur restaurant in the very swish Hotel Crillon. Mind you, it’ll still be very expensive, but hopefully not ruinously so. Paris in the fall -crisp cool air and clear skies; roads cleared of summer vacationers; new, cool restaurant introductions after la rentrée – is Paris at its best. And with a few tips to save some cash, your dream vacation in Paris may not be just a fantasy anymore. 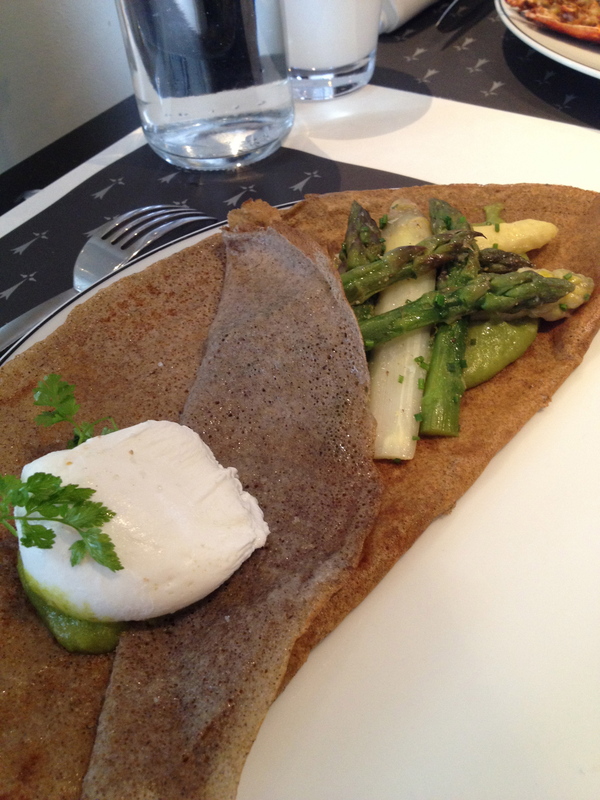 If you had one meal left in Paris after 15 dreamlike months in the city of light, where would you go? If I had been better at planning, I might have booked that blowout gastronomic event at a Michelin starred temple, or packed a basket full with bloomy cheeses, crusty baguettes and a bottle of champagne for a lover’s picnic by the Seine. But the fact was, I had not planned for a final culinary hurrah but instead anticipated a worst case scenario that involved eating takeout pizza while fretting about what to do with all those odds and ends that do not fit into the suitcases. Thankfully, with the help of a dear friend who volunteered to take and distribute all our stuff, we finished packing way ahead of schedule and found ourselves with a free Friday evening to do some last minute wandering and enjoy dinner. 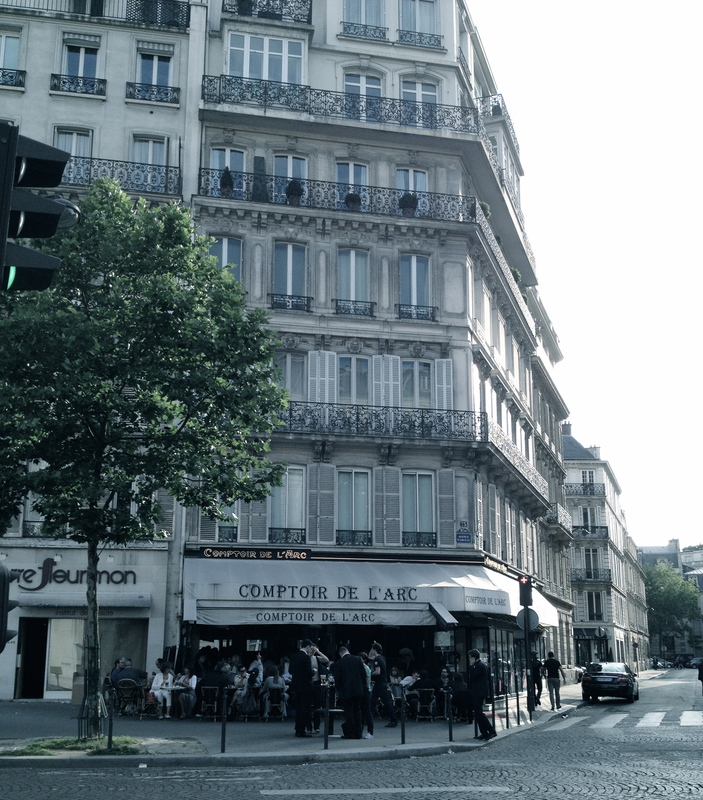 Enter Comptoir de L’Arc, a casual bistro on Avenue Marceau, one of the grand avenues that radiate out of the crazy Arc de Triomphe roundabout. For a location so near Champs Elysées, the clientele is decidedly local, most of them trendy young Parisians that populate the offices nearby. 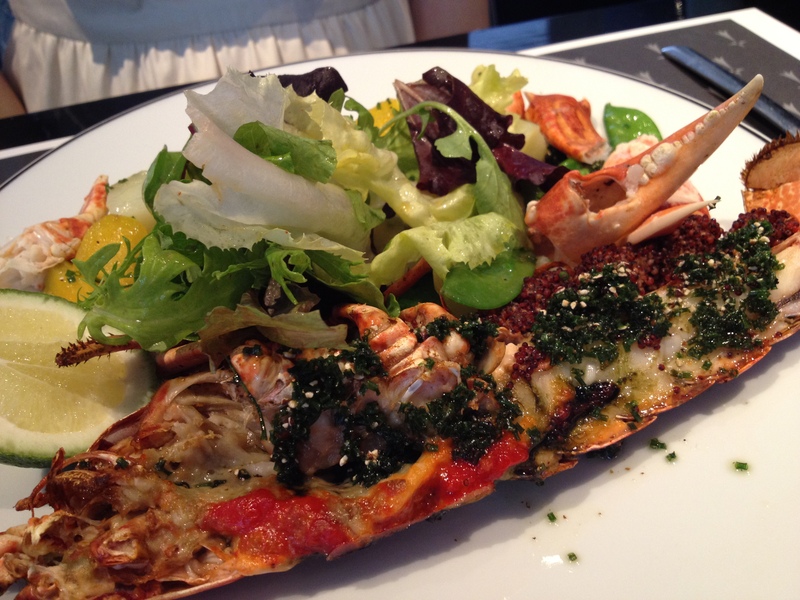 The vibe is buzzy and typically French, smokers and blasé service included. On that warm, light-filled summer night, we eschewed the darkly lit room and seated ourselves in the crowded terrace, in an attempt to absorb as much of that of-so-French café culture as we could. One reason this bistro is popular amongst young professionals is its economical menu. The salads, sandwiches and classic bistro dishes were freshly made, copious in portions and moderate in costs. 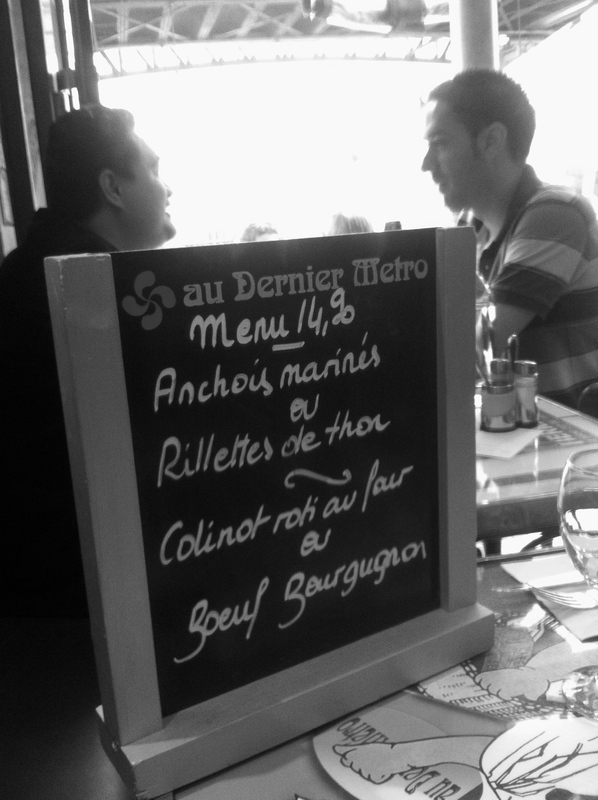 At 10e-15e per main dish, the prices were more akin to those at my neighborhood 15eme cafés than places in the 8eme. 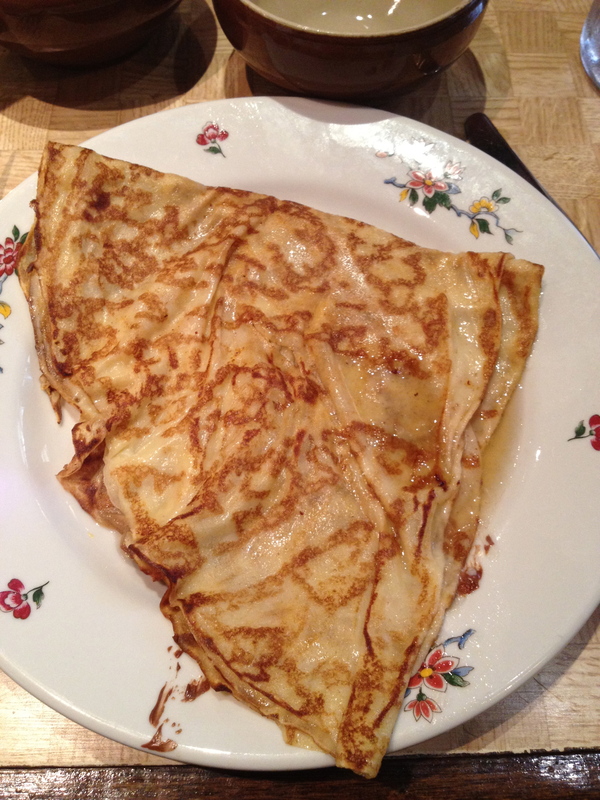 Actually the food also reminded me of those at Le Roi du Cafe, our go-to joint in the 15eme. 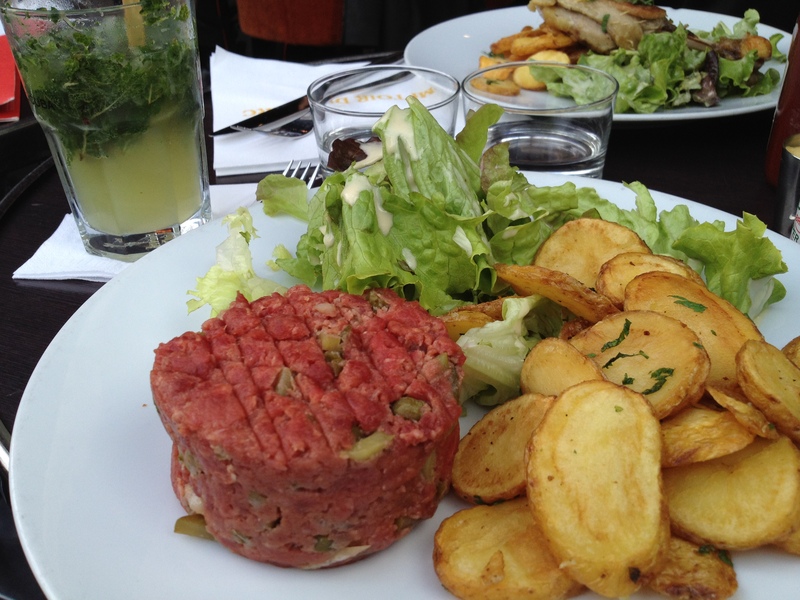 The steak tartare, while not made with the freshest hand-chopped beef was admirably seasoned, loaded with capers, parsley and onion to give it the tangy, spicy, refreshing kick that I love about steak tartare. 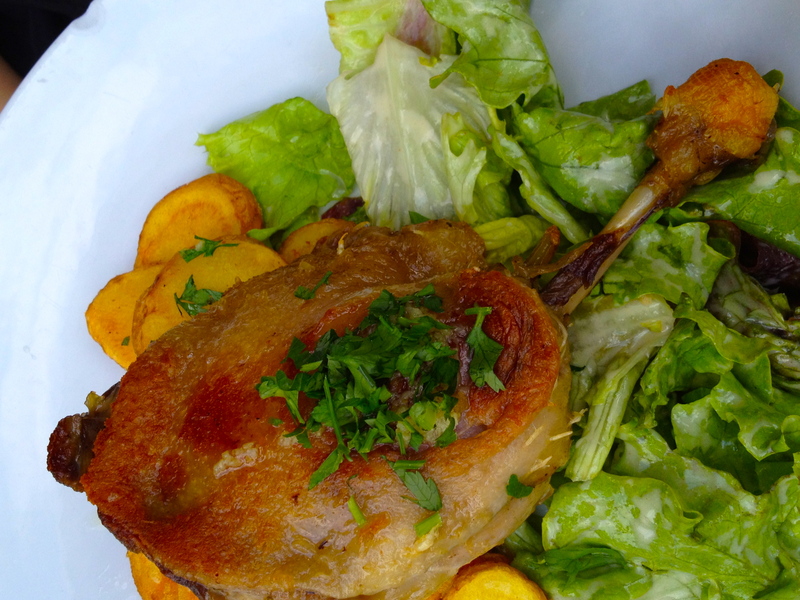 P was glad to have one last chance at his favorite French dish, duck confit, and the version here was decent, the meat not too dry under a golden, though slightly greasy skin. The food was nothing distinguished, but at 12e per dish, we had no complaints. Comptoir de L’Arc is a bistro that I have never heard of before our meal, and on more typical days, where each meal is obsessed over and each dinner reservation meticulously considered, we might have never eaten there. 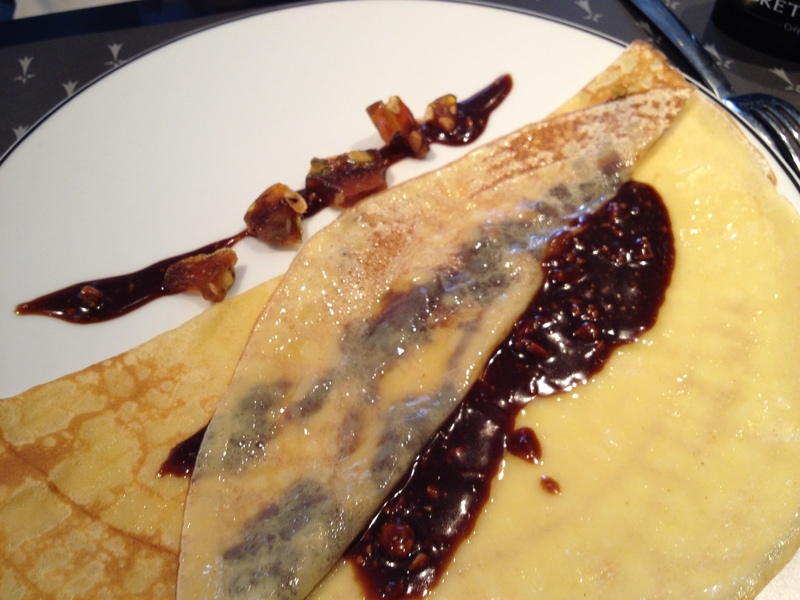 But as our last day in Paris – a day that started out in a frenzy but slowed down to a lovely evening of long strolls and our favorite dishes – showed me, sometimes we just got to leave things to chance. 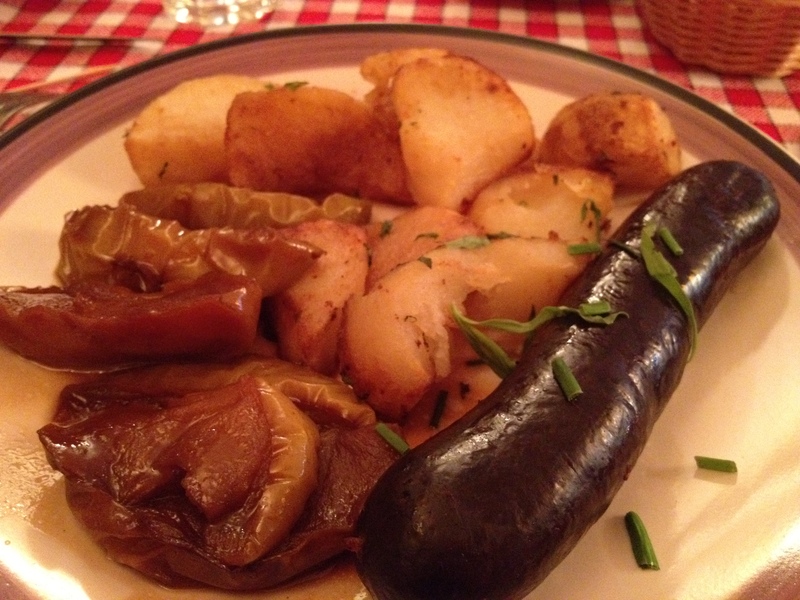 A year and some months in Paris has taught me that there is no such thing as a typical French dish. 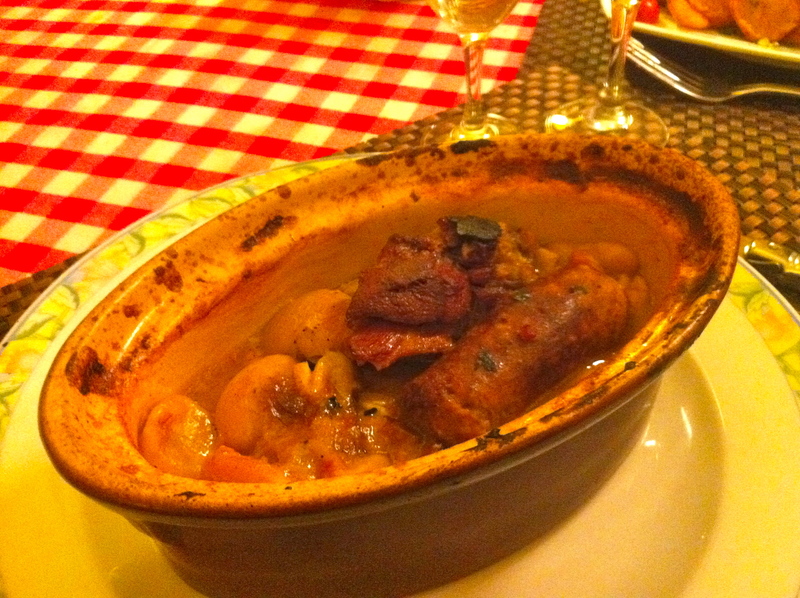 Instead, what we foreigners have assumed to be bonafide French dishes: boeuf bourguignon, duck confit, crepes, etc., are in fact regional dishes, the first from Burgundy, the second from the South-west and the last from Brittany. Each region has its own rich culinary culture, with specialties that capture the geographic and historical specificities, and it’s rare to find, outside Paris, a restaurant of one region outside its home turf. 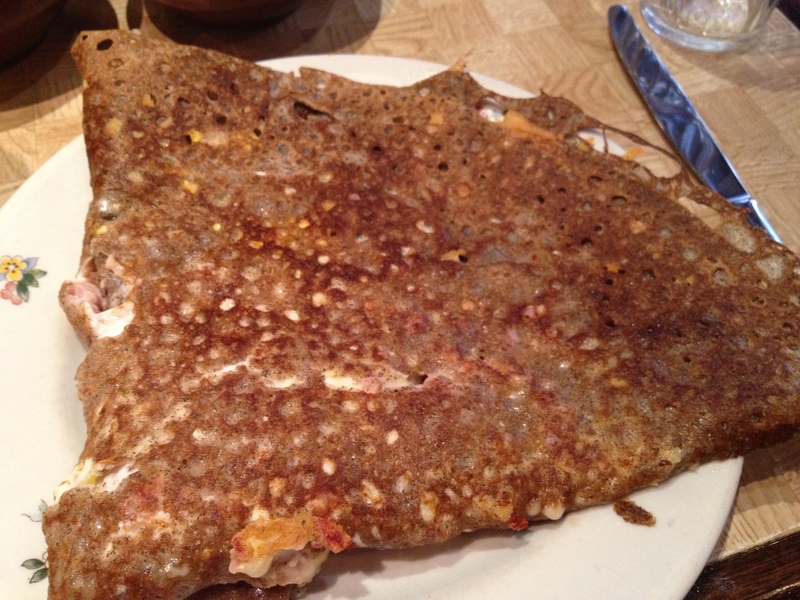 The one region lacking in iconic foods is Ile de France, that is to say Paris and its surrounding suburbs, but I guess the paucity of regional cuisine is more than made up by the excessive number of eateries in the city, French or otherwise. Terroir Parisien, a chic new restaurant headlined by Le Meurice’s star chef Yannick Alleno, aims to introduce the locavore concept to Paris by highlighting ingredients produced in the Ile de France region. One might have tasted chef Alleno’s Paris-inspired dishes at the Michelin 3-starred Le Meurice, but over here the prices are definitely more democratic, and the food, while not gasps inducing, was largely quite delicious. 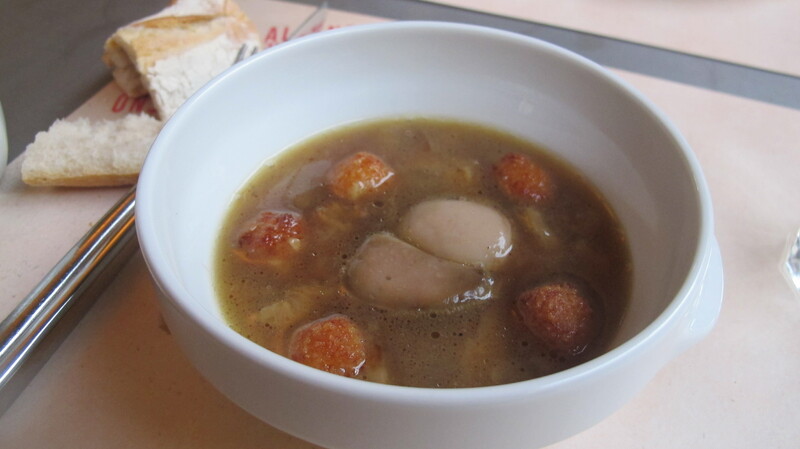 For starters, one could choose an onion soup (10e) inspired by the workman’s stew at Les Halles, the broth unapologetically meaty and further accentuated with bone marrow, the broiled cheese crust typically found stuck on the soup bowl reworked into bite-sized bowls of chewy, oozy cheese balls. Charcuterie is also on display, sourced from famous charcutier Gilles Verot, best known among Anglophones for supplying Daniel Boulud’s restaurants with terrines and sausages. P and YJ, our dining companion of the evening, both pronounced their museau (beef muzzle terrine) (7e) quite good with the tangy vinaigrette. 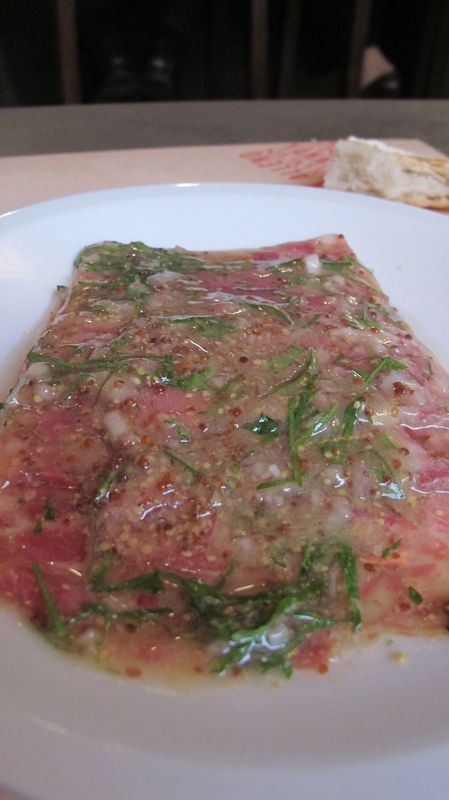 The plats tended on hearty, simple and copious, though those ordering fish would do no wrong if YJ’s plate of firm, sweet skate meat (18e) was any indication. 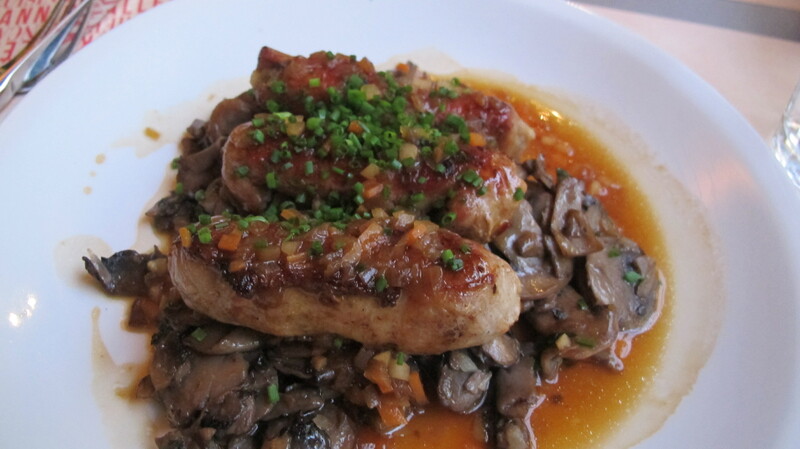 My order of alouettes sans tete (21e) did not feature headless larks but was instead rolled veal slices stuffed with meat and mushroom duxelle, the champignon de Paris appearing in a second form, sliced, buttered and soaked in deep veal fond. 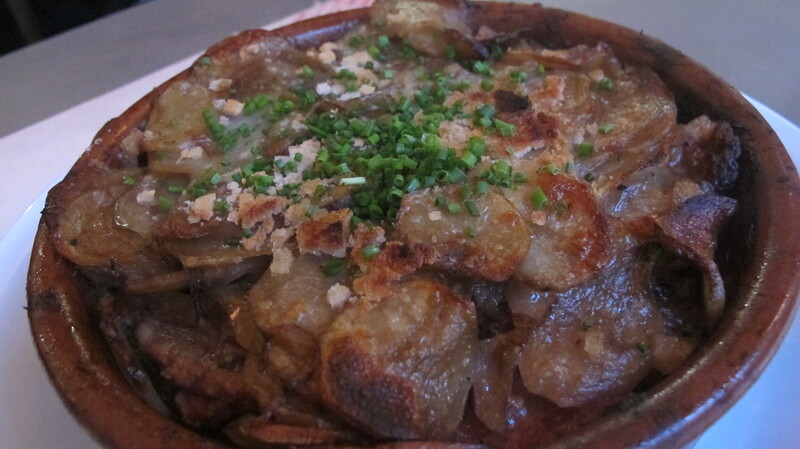 P can never resist lamb, though Terroir Parisien’s version of agneau champvallon (19e), a casserole of lamb chops hidden under a cover of crisp potatos, was a tad too heavy even for him. 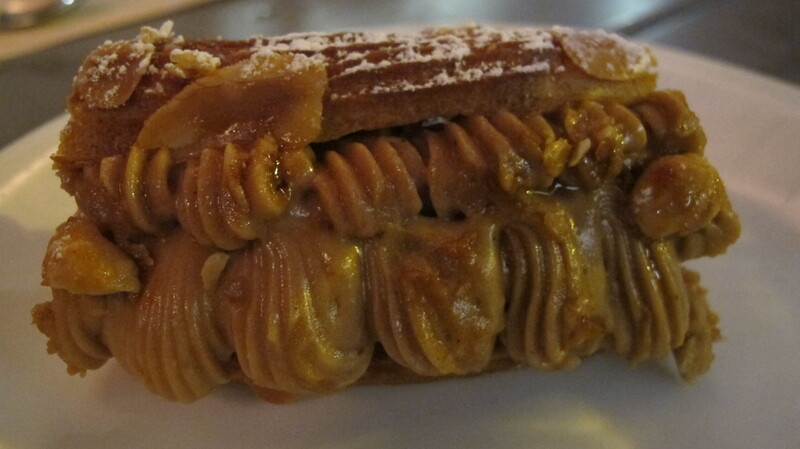 Keeping in mind the difficulty of locating good choux pastry in Singapore, P and I ordered the Paris Brest (7e as with the other desserts). Unfortunately, this version was sub-par, the pastry slightly tough and tasting refrigerated, whereas the hazelnut and caramel cream was too sweet. Good thing YJ convinced me to take a bite of her flan. 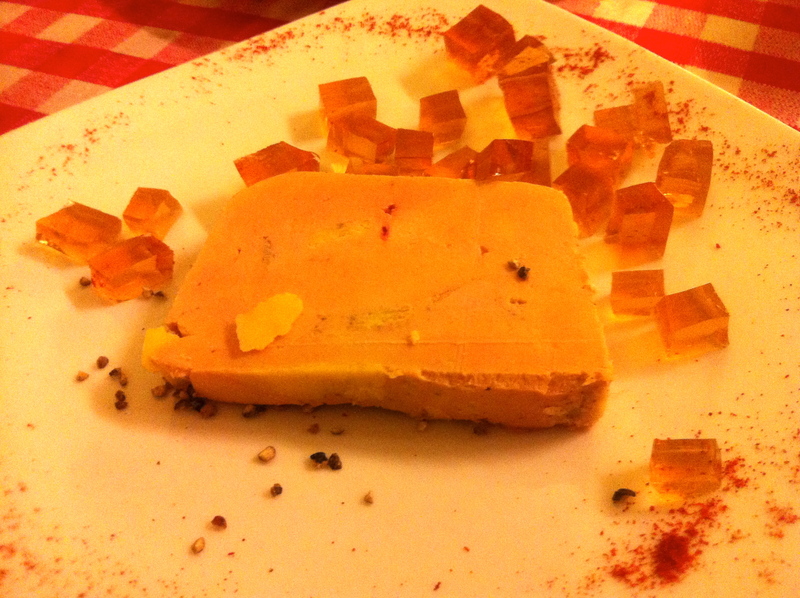 Flans are ubiquitous in Parisian bakeries but I’ve hardly ordered them as they always looked pasty and gummy. 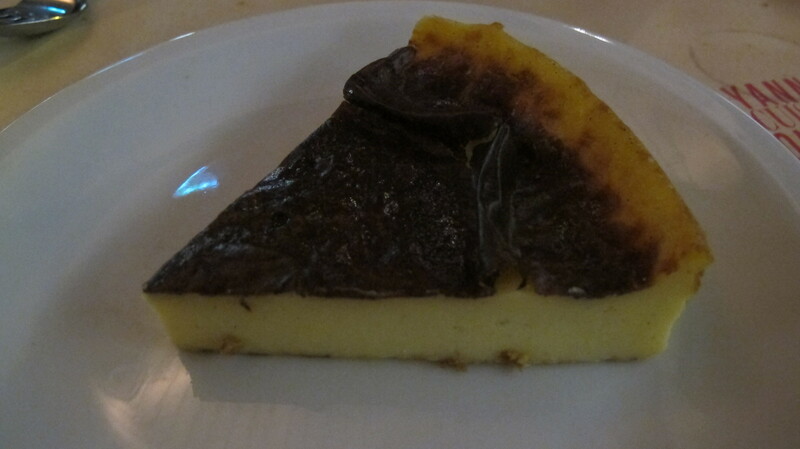 This flan changed my opinion, the solid custard underneath a blacken film silky smooth and fragrant with egg and vanilla. What can I say? 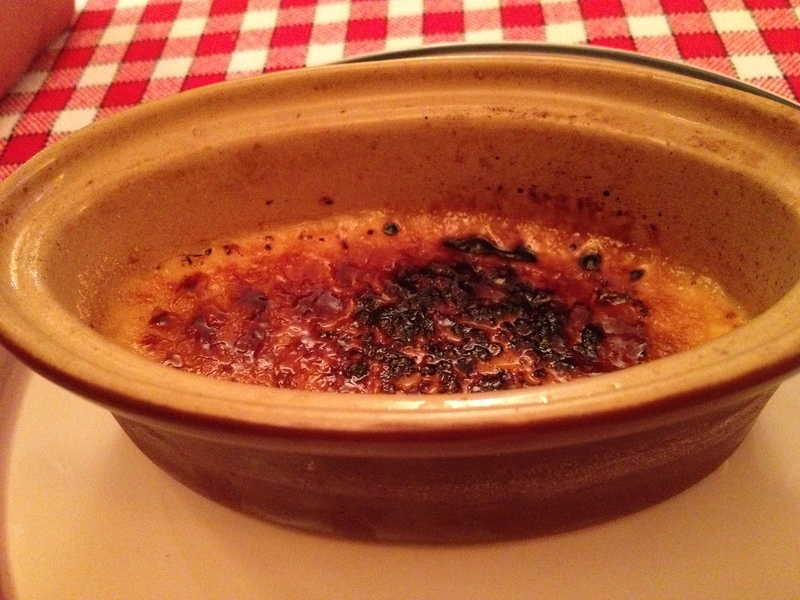 Not all flans are made equals, and this one put its brethren to shame. The modern space with a large oblong bar as its centerpiece evokes a relaxed, smart-casual vibe. The bar also outfits Terroir Parisien to be one of the rare places in town where a solo diner can be seated at the centre of action. But it is equally appropriate for a convivial meal amongst friends. So it’s fitting to say goodbye to YJ, one of our few French friends made this year at a restaurant that celebrates all things tasteful and Parisian. 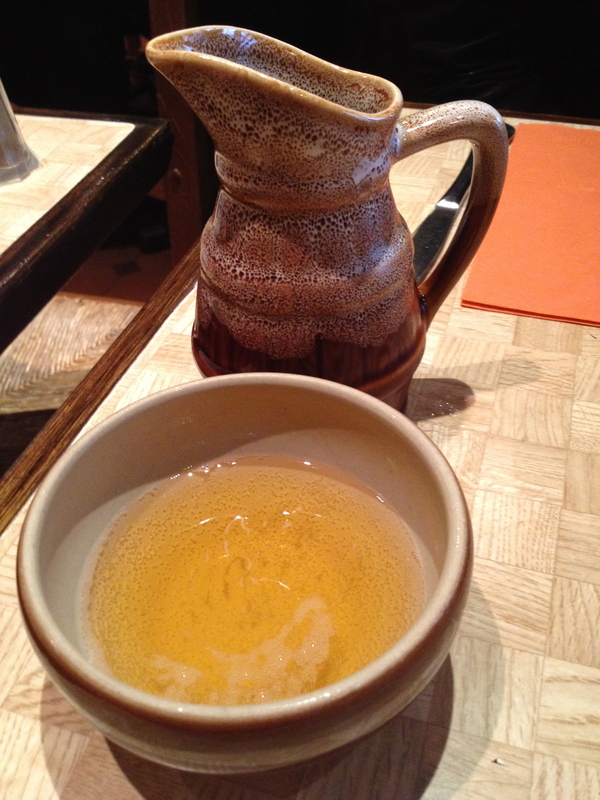 Many things I will miss from our Paris days, of which tea-time is high on the list. It is an afternoon ritual I’ve picked up during this year of sabbatical, where idleness is a virtue, decadent french patisseries rites of passage, and meaningful discussions amongst friends or quiet self reflection rewards at the end of the afternoon. 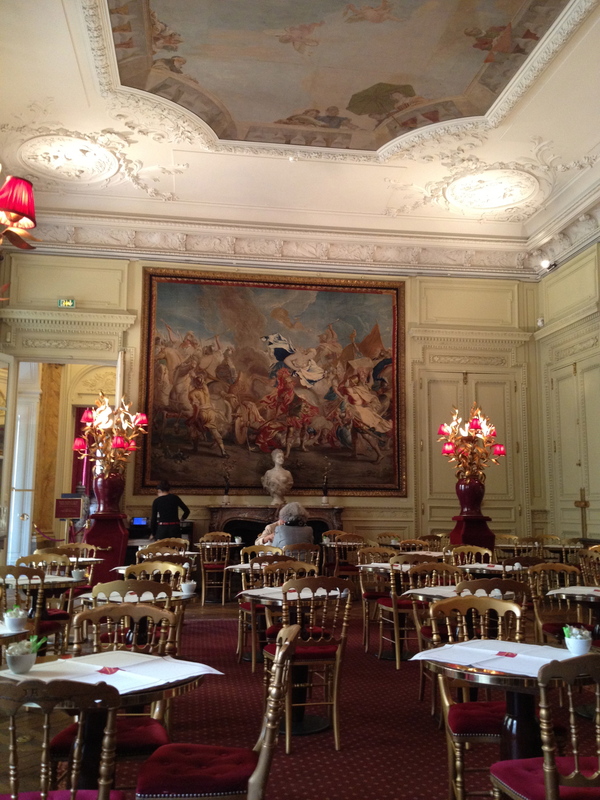 There are a thousand and one places to drink tea in Paris, the café in Musée Jacquemart-André merely one of many distinguished locales. But it is certainly one of the most picturesque. In tony 8eme, the tearoom (salon de thé) is set in the original dining room of Monsieur and Madame Jacquemart’s hotel particulier, now a private museum named after these two art collectors. The entire compound exudes elegance and money-ed tastefulness, the red and chrome accented dining room notwithstanding. One talked-about piece of artwork in this bijoux of a museum is located in the salon de thé itself, the ceiling fresco painted by Tiepolo. 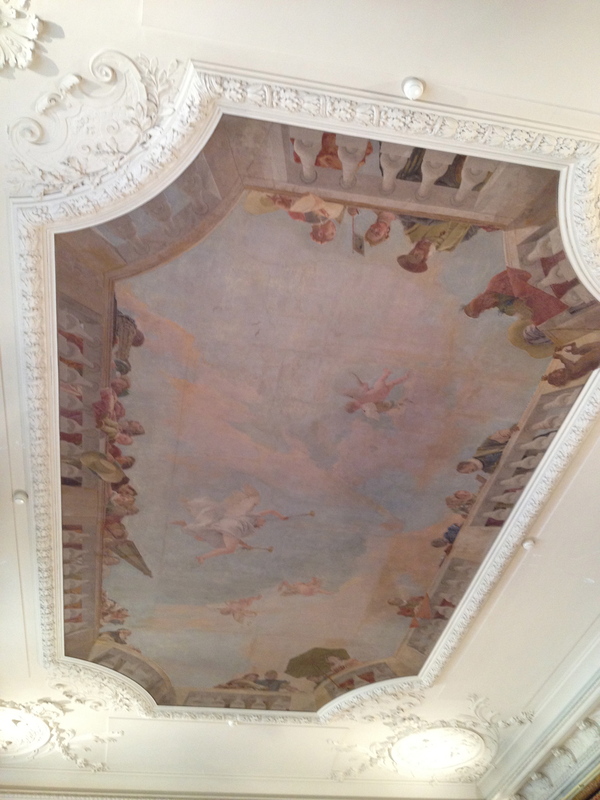 It is under this ceiling depicting King Henri III’s visit to Venice en route to Paris where one can sit and sip, to eat in the gorgeous setting and the equally good-looking patisseries sourced from Stohrer and A La Petite Marquise. The selection while not wide covers most bases, so there are rich chocolate tarts, raspberry filled macarons and flaky millefeuilles on a single day to cater to every sweet craving. At less than the price of a museum ticket (10.20 euros), the tea formula buys one a dessert, a tea or coffee and the right to linger and daydream of the day one becomes master of a mansion.